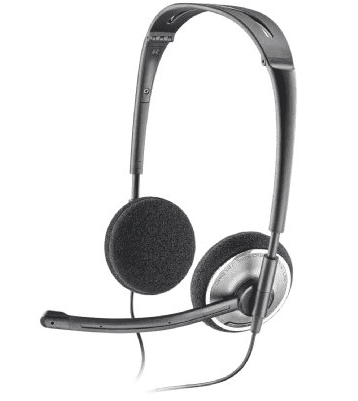 Outfitting your agents with a proper call center headset is absolute key to ensure the highest level of productivity. Comfort, noise reduction, and reliability are the most important factors to consider when searching for the right headset for your agents. 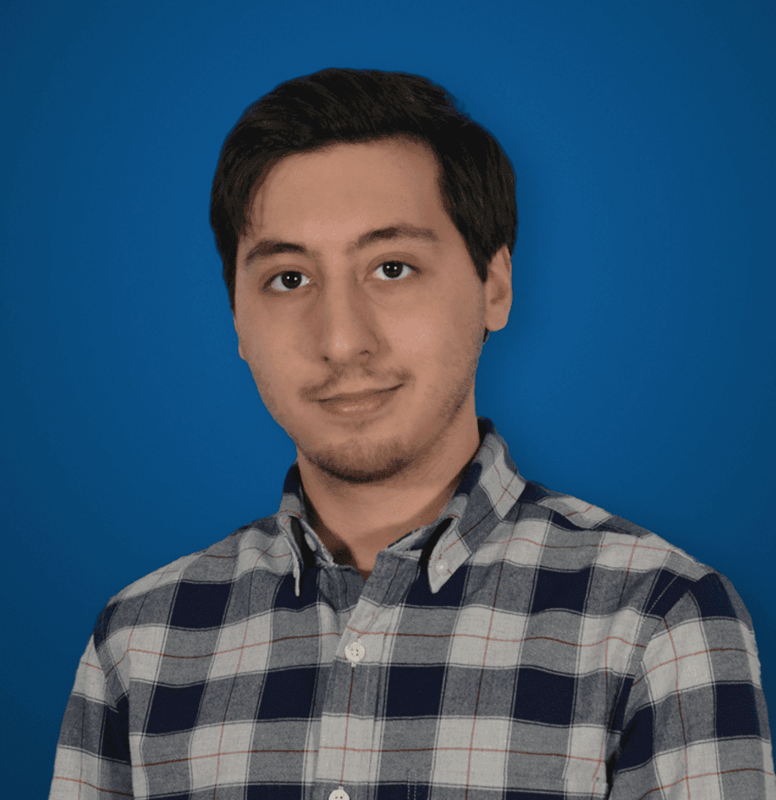 If a call center headset grows uncomfortable after hours of wearing, it will have a drastic impact on your agents efficiency, even for remote agents. A lack of noise reduction will lead to unprofessional calls and lost information as your agent and caller are trying to communicate, and of course no one wants a headset that will break after only a few months, or even weeks, of usage. 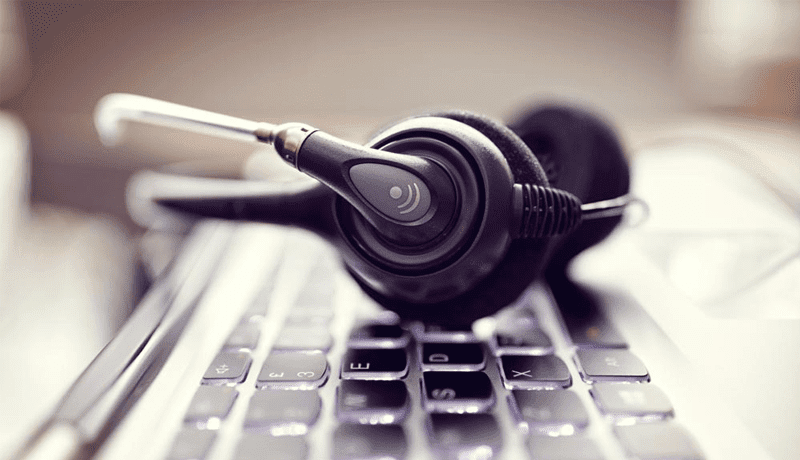 We went ahead and put together a list of the top rated, most cost effective call center headsets for your agents, with a strong focus on these three factors: reliability, comfort and noise reduction. For an added bonus, although not as imperative, some of the headsets are also wireless to allow for more freedom when on the phone. Just like when it comes to call center software and call center automations, there are many alternatives. 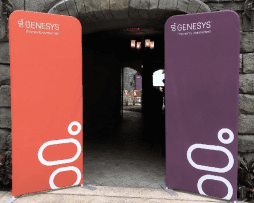 Whether you run a call or contact center, equipping your agents with the proper tools is absolute key. The first on our list is certainly likely to be one of the most popular options. 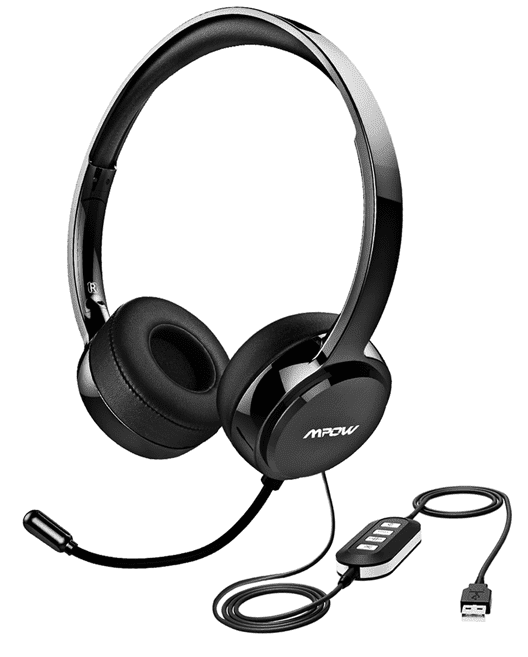 While not many will be familiar with Mpow, this fairly basic headset is an Amazon #1 best seller. Coming it at a low price of around $20, this headset is stereo, has a flexible mic with noise reduction, and even has some built in controls — microphone and speaker mute buttons as well as volume controls. 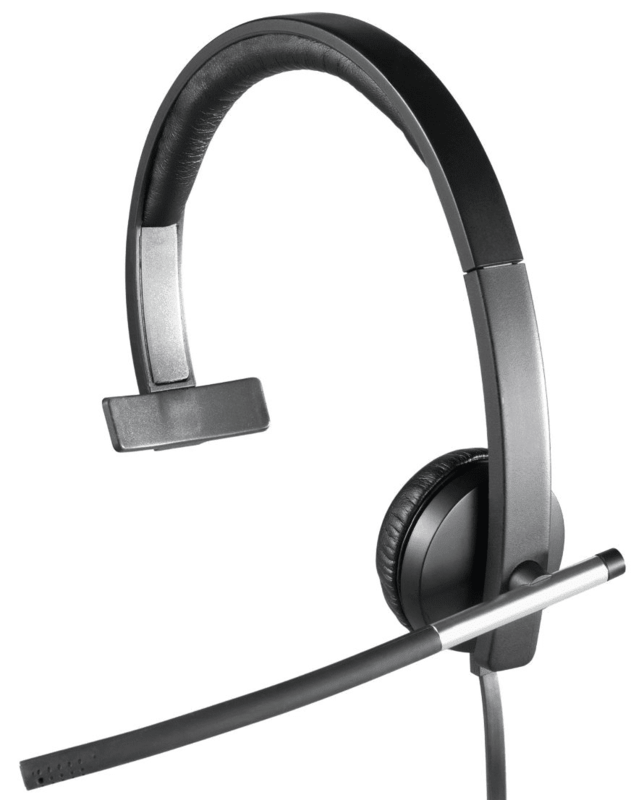 In all honesty, this affordable headset will fit the needs of most call center and contact center agents. A USB connection also ensures universal compatibility with any laptop or desktop computer, and even some mobile devices. Not only is this headset a #1 seller on Amazon, it also has over 2,900 reviews, and is currently sitting at 4½ stars. This headset is available for purchase on Amazon here. One of the more cost effective wireless options, the VXi BlueParrot B350-XT is a noise single ear, cancelling Bluetooth call center headset. VXi states that the noise cancelling microphone can completely eliminate up to 96% of ambient noise to keep your calls quiet, and even contains a power button as well as volume controls, and a single customizable “Parrot” button for any function you need. Of course you can utilize this button as a hardware mute button, or even an easy to use speed dial. Trumping the D901 in batter life, the BlueParrot B350 supports up to 24 hours – that’s right an entire day- of talk time, and even allows for iOS battery charge monitoring. 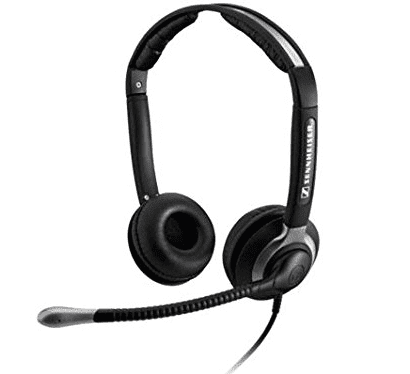 Often considered one of the best names in standard audio headphones, the German manufacturer Sennheiser has even made their way into the call center headset market. The CC 550 IP offers the high quality precision sound you would expect from a Sennhesier product, with a USB connection, a noise cancelling microphone, and even ActiveGard technology to protect against acoustic shock and sudden sound surges. The CC 550 IP is also backed by a 2 year warranty, and boasts extra comfort with extra large ear pads to help distribute the pressure, and even a generously padded headband. 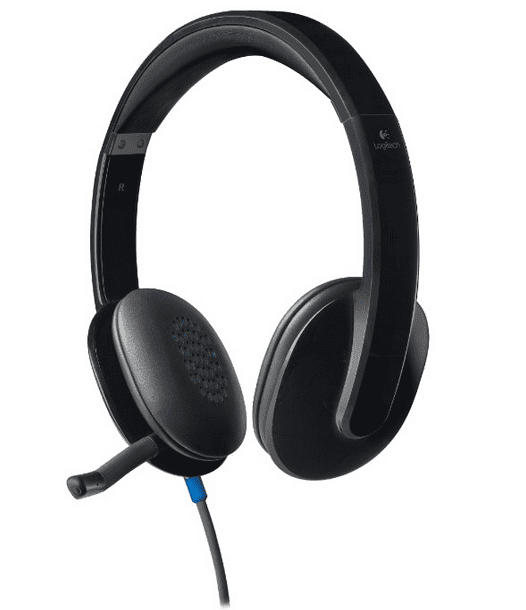 A more modern option from Logitech is the Mono H650e business class headset. As the name says, this is a mono or single ear headset, which makes this headset great for agents that might need to converse with coworkers in between calls, since one ear is already free of any headphones. The lightweight design should also prove comfortable for long periods of wear, and the noise-canceling unidirectional mic should do a great job of focusing on your vice while blocking out the background noise. Optimized for Microsoft Lync, and “laser-tuned drivers” for crystal clear conversations make this Logitech a great option for those that attend a lot of video or voice web conferences throughout the day. There’s also a wireless option for those that like to cut the cord, but note it is double the cost. If you are looking for a professional grade headset, without a professional grade cost then the Plantronics Blackwire 310 is a great option. With simple and light headset design, the Blackwire 320 would be great for wearing all-day. This entry level options is perfect for anyone that is looking for reliability and build quality. And not only are you getting the quality and reputation of Plantronics, but its at an incredibly affordable price-point. 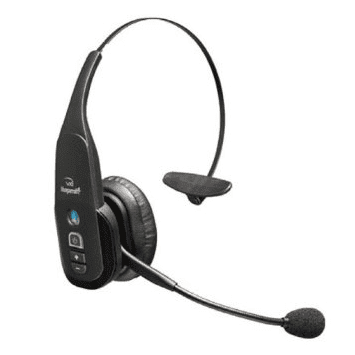 In fact, despite being a more affordable option, the C320 has a metal headband to ensure durability, and even includes a physical mute button, volume buttons, and a USB connection for universal comparability. As an even more cost effective entry model into the Sennheiser brand, the SC60 Culture Series headset connects via USB and also promises the high quality Sennheiser sound the brand is known for. The noise cancelling microphone, high-comfort padding and dual-side wearing for stereo sound as well as call control buttons bring this headset up to par. As an interesting feature, the SC60 allows users to redial the last outgoing call and even reject incoming calls with the hardware in-line call control buttons. 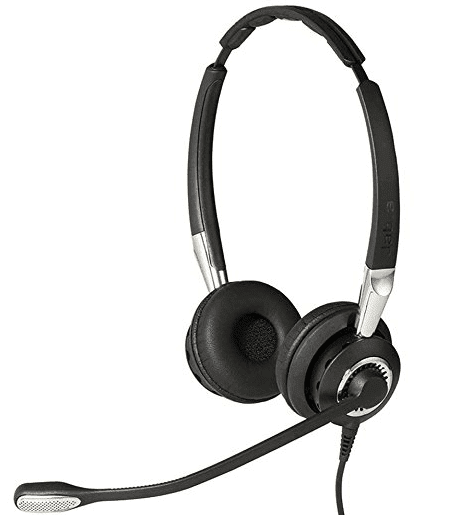 If a premium brand at cost effective prices is what you’re after, the SC60 is a great choice for a call center headset. Plantronics has crept its way into our list a few times already, and continues to do so with another incredibly cost effective option – the Audio 478. Around $25 on Amazon, this fold-able call center headset rivals other inexpensive options such as the Logitech ClearChat. 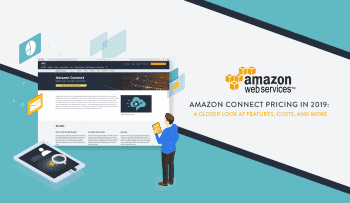 However, Plantronics includes some extra features like Digital Signal Processing to scrub away any static that makes its way into the line, and even helps prevent any echo from occurring. The usual inline controls are included as well, with mute and volume controls, as well as answer and end controls for Skype calls specifically. The VXi BlueParrott line also includes a wired option, and the 2031U manages to stay incredibly cost effective. 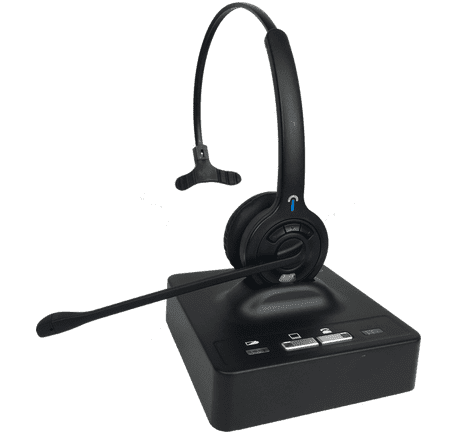 This BlueParrot headset also includes DSP for clear conversations and high sound quality, as well as inline controls and even boasts compatibility with Avaya One-X, Cisco Jabber, and Polycom USB Phones. 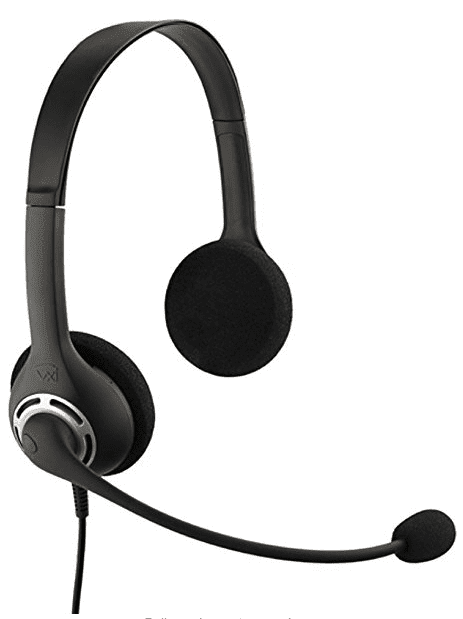 We were able to find this headset often bundled in a two pack for only $79.95 on Amazon, making the 2031U a basic, but one of the cheaper options for call center headsets. An included 2 year warranty is also compelling, as other options at this price point might require the purchase of a protection plan. Probably one of the more unlikely names to see on this list is a Microsoft headset, specifically the LifeChat LX-6000. Wideband digital audio ensures some of the highest sound quality, especially for the price point of $37.95 that we found on Amazon. Again, the headset includes a noise cancelling microphone, inline controls, as well as padded headband and ear pads for all day comfort. The LX-6000 even comes with something only seen on more expensive headsets, a call indicator light so coworkers know when you’re on a call and busy. As a more robust option for the Logitech line, the H540 adds a few more features, and size, over the previously mentioned H390. 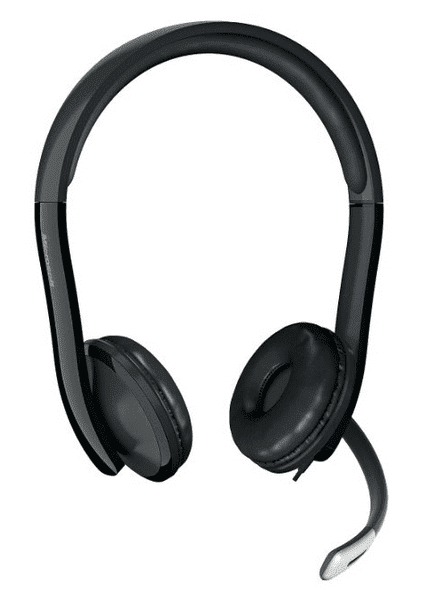 Still a plug and play USB headset, the H540 also has a rotating noise-cancelling microphone, on ear controls, and an “ultra-comfortable design” for hours of continued use without much discomfort. A feature yet seen on other headsets, the H540 also adds a mute indicator light so your agents will always know if they accidentally muted themselves, and hopefully prevent long awkward pauses in the conversation. 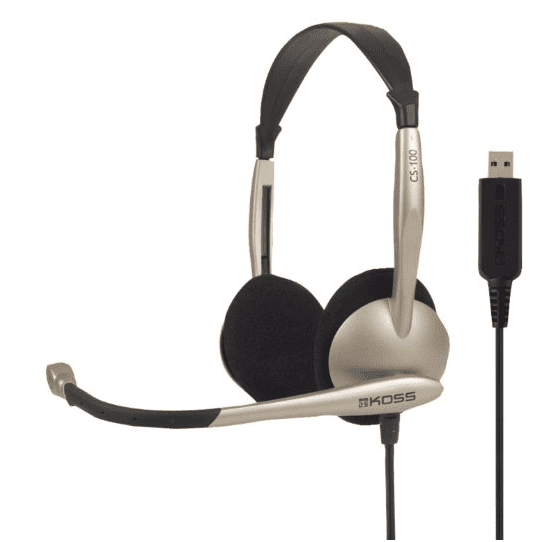 Another brand known for their high quality headphones, Koss also offers a high quality USB headset for call center agents. The CS100 USB contains a noise-canceling microphone, of course, but with high noise sensitivity and reduced sound distortion similar to the DSP seen on other models. To help with comfort, Koss even allowed the ear pads to rotate about 30 degrees to ensure a snug fit, and while it loses some features like inline controls, with a lifetime warranty and the Koss name behind it, the CS100 will be one of the more reliable headsets on the market. Coming in a bit higher on the price list, the Jabra Evolve 80 is a heavy duty, robust headset with all the bells and whistles. The Evolve 80 was actually developed with both business professionals and even music lovers in mind, so you can be sure these headphones will provide crystal clear sound. A noise cancelling button lets you enable or disable the function, and the headset connects through USB for easy adoption. Something really unique, the Evolve 80 comes with a built in “in-use indicator” – a red light on the headset so your colleagues know not to bother you when you’re on a call. 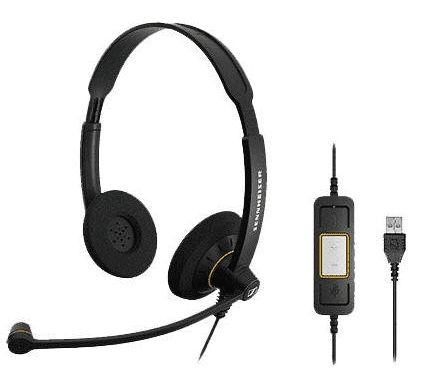 With both a USB connection and wireless Bluetooth connectivity, the Blackwire 710 and 720 are incredibly versatile call center headsets. The benefit of a wired headset that allows for wireless connectivity is of course that if the battery dies, you can still use the headset to make and receive calls. Bluetooth also allows your agents to make calls on their mobile phone or tablets as well. Smart sensor technology lets users answer a call by simply placing the headset on their head, or pause media by taking it off for even more productivity. Not to mention the noise-cancelling microphone, and hi-fi stereo sound. 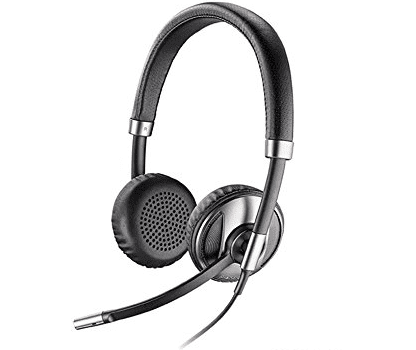 The latest version of Jabra’s most popular headset, the Jabra Biz 2400 II, is one of the top rated stereo call center headsets. Of course with a noise cancelling microphone, a USB connection, and even intuitive call controls right on the headset – including volume controls, an answer and stop call button, as well as two programmable soft buttons – the 2400 ticks all of the right boxes. Jabra even backs the headset with a 3 year warranty, and boasts an unbreakable 360 swiveling boom mic, and a Kevlar-reinforced cord to ensure long term reliability, and HD voice and audio capabilities. If wireless is what you are after, then the Merrit Communications Discover D901 is the crown jewel. With up to 1200 feet of wireless range, you can be on the other side of your office and never miss a beat. The lightweight single ear design helps ensure all day comfort, and 100% compatibility with PC and Mac machines makes setup a breeze. With a 9 hour battery life agents won’t have to worry about charging during the day, and when not in use the headset can simply be placed on the charging dock. A full charge will even be completed in a staggering 45 minutes. I need a TELEPHONE headset, meaning that it plugs into a LANDLINE TELEPHONE with a phone type connector. I need one with quality sound and comfortable. I’ve tried several and have either poor sound quality or they leave a dent in the top of my head (and lots of headaches). I’ve also tried to find an adapter that will connect a USB headset to a phone, but no luck. Any ideas? Anyone? If you know of one under $75 please leave email me at ekparris@gmail.com Thank you. Hi Eleta, thanks for your comment! I’ll be more than happy to take a look at the options out there, and send over a few recommendations. Expect an email from us soon! Thanks again. I need the same thing! I have the Avaya 9608 and it has a headphone jack option (Looks like a standard handset cord jack) which I know most of these brands sell an adapter for. I cannot use a USB headset, which is a pain but one I’ll have to deal with as I’m sure my employer is not going to buy me a new phone to get me a headset I want lol. Please help! Check out my answer above. Get the trusty Plantronics H51, and a Plantronics amplifier to plug it into. Both together might be a smidge more than $75 if you get a refurbished headset, but I used that headset for tech support work for many years with great results. you can try Mairdi call center headset, super comfortable but with affordable price, email me at vicky@mairdi.com for more details. 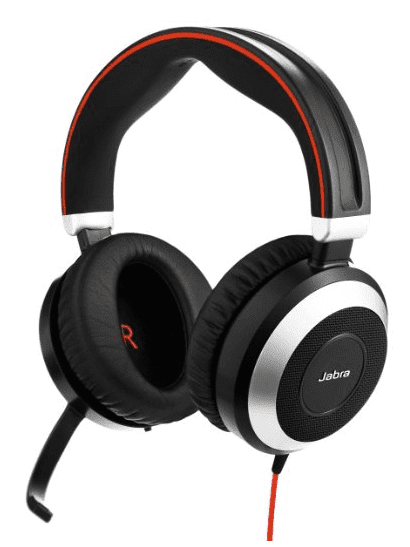 Go with the Jabra uc 40 stereo! Do all of the headsets you listed meet the specs required for call center work-at-home jobs? I’m planning to do freelance work so there’s not any one employer whose specs I need to meet… Is this even possible, or does each employer have their own specs that are different from the others? Well, I didn’t notice the date this article was posted. For anyone actually reading this now, I went ahead and ordered a headset “VTIN” from Amazon Prime. It’s just a basic USB headset with a mic that can also be plugged into my cell phone (detaching the USB adapter). So far it works great, the clarity of voices are good on both ends. The headset is fairly comfortable, canceling out most noises, but not all.